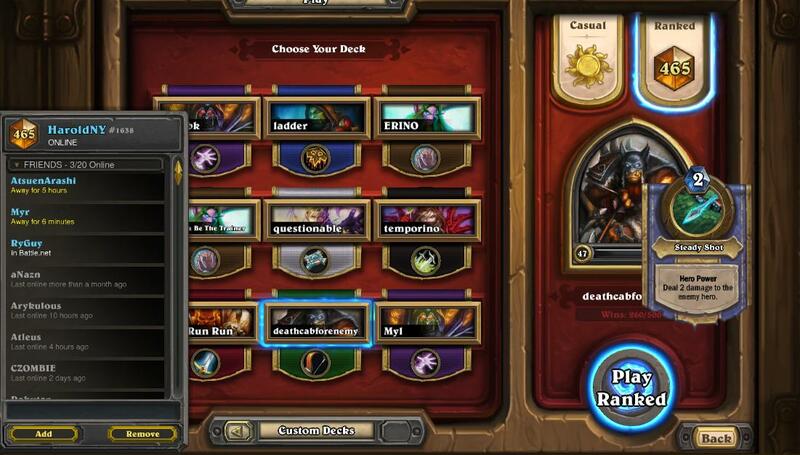 I did not keep track of my games via 3rd party programs so I have no idea about winrate but I strictly only played midrange hunter from ~rank 6 and having wins on the class prior(like 80-100 or something) I just tried to subtract. Going from estimated statistics that’s around 55% win rate or something. Yes some luck will always be involved but to quote Seneca: Luck is what happens when preparation meets opportunity. I am by no means the end all be all and am barely decent. Playstyle overview: With midrange hunter its all about tempo aka putting down lasting minions and making mana efficient plays while forcing your opponent to make mana inefficient plays to kill your minions while utilizing that tempo to gain effective board control and whittle them down to ultimately finish them off. With this kind of deck and the availability of tracking you need to understand your win condition(how will I finish them off?) and what is left in your deck to play optimally. In current meta you must be able to comfortably face zoo with any decklist. In general with midgame hunter unless you’re going for the kill next turn and cant get killed yourself (Or can’t prevent force savage combo for example) developing board control > damage on face. In general plays like this are very hard to answer so the damage per turn(dpt) adds up. In order for the shaman to answer this effectively he needs spell totem into earth shock into lightning bolt/rockbiter, so now you know that he doesn’t have these cards anymore. 2x Hunter’s Mark: Allows you to easily get rid of large threats(legendaries, ancient of war, etc.) and minimize their trading potential but also most importantly is that it can provide a great tempo play (hunter marking zoo 4/4 or 5/7 charger). 2x Tracking: Amazing card that allows you to setup a perfect play or dig for finishers/combos. Arguably best card in the game. 2x Stonetusk Boar: Extremely useful card that combos with most cards in the deck. I’ve been tempo playing it turn 1 against druids in an attempt to force wild growth vs. hero power decision unsure if this is 100% correct. 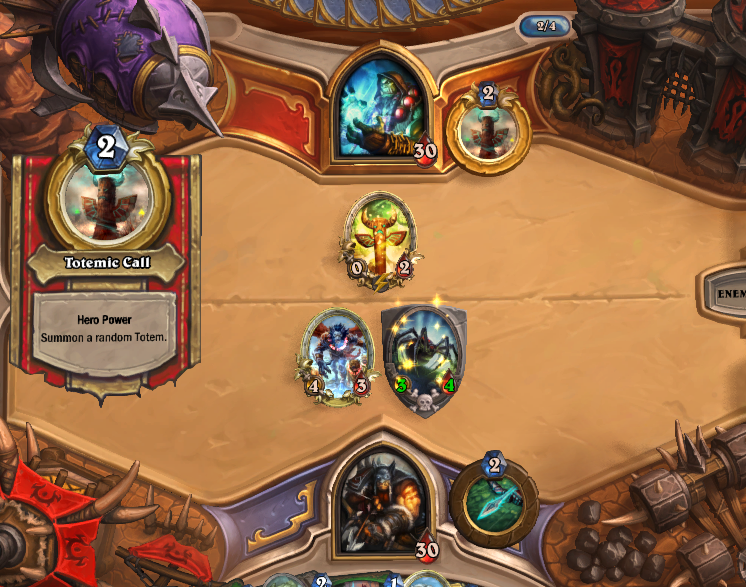 Its not that good played turn 1 against zoo. 1x Timber Wolf: Okay card that again combos with starving buzzard/kill command and rarely with hunter’s mark/houndmaster. But most importantly it combos with UTH. 2x Explosive Trap: Used to run 2x freezing but lolzoo. Prone to popping nerubian egg but is a solid turn 2/coin play against aggressive start. 1x Freezing Trap: Extremely useful tempo card, can be used to counter innervated creatures like yeti or to just delay the game. 2x Haunted Creeper: Amazing card that allows you to fit creatures on curve early on. Very annoying to kill and is also kinda useful in baiting silences. Playing this turn 2 > hero power. 1x Ironbeak Owl: Can silence taunts for the kill, and prevent annoying creatures/deathrattles/nerubian egg. Can also combo with starving in desperation situations. 2x Starving Buzzard: Only card drawing mechanic for hunters but a great one. 2x Eaglehorn Bow: You are a board control deck first, kill second. Save up charges unless you’re pushing for damage/have two bows in hand but try to plan out mana curve. 2x Animal Companion: Coin animal companion turn 2 into animal companion turn 3. Combo UTH/Haunted creeper with leokk. Huffer for damage (but is most easily removed) or get a 3 mana 4/4. 2x Kill Commands: 3 mana for 5 damage /finisher/yeti killer/removal. 2x Houndmaster: Amazing card and insane turn 4 tempo play. Creates hard to answer boards. 2x Oasis Snapjaw: insane stats for card but low attack however it is very durable especially against zoo/druids. Coin oasis into houndmaster is ridiculous. Prone to getting sapped but still good. 1x Savannah Highmane: Great tempo card that is very difficult to answer properly when its played on a clear board aside from hex/poly(which almost takes up whole turn early game). 1x Leeroy Jenkins: 4 mana for 6 dmg finisher card, combo with UTH+timber for 10 dmg combo on a clear board with +2 dmg per enemy minion or just UTH. Very rarely used outside of finisher. Arcane golem is a very ineffective replacement. Possible considerations: Flare – Gives solid turn 1 play + completely counters freeze mage. Mulligan: Always try to find a nice curve (turn 1 tracking, turn 2 creeper, turn 3 animal companion, turn 4 houndmaster). If you’re on coin trying to obtain uth+buzzard against shaman/zoo is fine(still need turn 2/3 play outside of that). If you’re not on coin keeping uth+buzzard is a turn 5 play which gives you only one guaranteed playable early game card aka no. Because midrange deck is full of good early game cards its also a bit difficult to have terrible early start. Zoo: You are on the defensive early on. You want to prevent their dpt as much as possible. You need early game cards. Explosive/Freezing answers flame/knife juggler or the shattered sun/young priestess that buffs it. Nerubian egg is interesting because it delays the game a bit which is good for you but bad against explosive trap. Animal companion almost always trades 1 for 2 (Soulfire+discarded card, or huffer breaking through voidwalker+other minion). Eaglehorn bow is good because it also trades 1 for 2. Kill command is decent only if you have no other plays, its good for killing the beefier creatures zoo contains. If you’re getting pressured hard then preemptive uth isn’t bad(unless he has voidwalker up). Try to save hunter’s mark for 5/7 charger unless using it on 4/4 gives clear board/huge tempo play. Druid: Turn 1 stonetusk boar gives interesting decision, to wild growth or hero power. If he innervates yeti/teacher coin kill command answers nicely. Less useful if no followup turn 2 play. Druids generally play slightly slower so keeping oasis isn’t entirely bad because druids also generally lack hard removal. Freezing trap innervated creatures. Savannah highmane is very difficult for a druid to properly answer with a clear board. Shamans: Has the best answers out of any class I feel however they lack any heals. You want a good curve and baiting out hex prior to savannah highmane isn’t bad but sometimes playing it down is a must. You can generally win as long as you draw into uth but try not to drag out the game too much as they can easily outvalue you. Freeze Mage: Try to force them to activate your deathrattles with their aoe. You generally have enough dmg to proc ice block prior to turn 9 giving them a difficult dilemma. Hunter’s mark deals well with the 0/7. If you’re facing many of them just swap in a flare and mulligan aggressively for it. Handlock: Can generally win out due to easy access to direct damage. Don’t be afraid to leeroy as long as you can execute him the after as leeroy cannot get in any damage effectively with taunts in the way. The most a warlock can heal is alexstraza on turn 9 and prior to that double earthen ring farseer for 6 or siphon soul for 3. Don’t burst him for moltens unless you’re 100% sure you can kill. Freezing trap kills the mountain giant. Priest: Same as druid. Try not to overextend too hard into their aoes and keep in mind your finishers. If they have an a soulpriest then they can’t heal. Control Warrior: Only faced ~2-ish. You need a smooth curve and board control. Keeping buzzard isn’t entirely bad as you need to keep up board control/pressure. Aggro decks: Same thing with zoo but more aggressive. You want to minimize their dpt. Freezing trap is great. I’ve beaten most aggro hunters with animal companions+houndmaster. Paladins: You want to close out the game on turn 8/9 as they can easily beat you out in the late game. They’re hard pressed to find a proper answer for your minions. Only faced a few of these guys. Do I stream? No because my net is okay at best but I can if people want to watch midrange hunter. Feel free to leave any questions and do leave any possible recommendations to the deck/improvements.